There are many different joints and techniques used to join two bits of wood together. Using a biscuit joint hides the join from view. If you are looking for a very professional, flush and strong finish to your projects then choosing the best biscuit joiner can help make that process much easier. There are a variety of models to choose from. Some are suitable for those on a budget and others that are many times the price of the average biscuit joiner. One thing is for certain if you intend on using a lot of biscuit joints regularly in your projects then you need to be sure that the biscuit joiner that you choose is not only reliable but will give you the flush and more importantly accurate joins that you require. ​What is a Biscuit Joiner? Confused by which model is the right biscuit joiner for you? Our top pick would be the Porter Cable 557. It's 7 Amp motor packs a mean punch and has one of the most adjustable fences available, from 0 to 135 degrees with positive ​adjustable stops at 90 degrees. Seven different cut settings and a fence that is adjustable from 0 to 135 degrees. Below we have profiled the top 5 biscuit joiners available. For the averagely busy woodworker the Porter Cable and the DeWalt are more than suitable. They both offer a perfect blend of both features and affordability. Looking for a suitable biscuit joiner if you are just starting out or need one for a one off simple job then the TruePower is easily the cheapest joiner here. On the other end of the spectrum the Lamello is the leading high end established brand for biscuit joiners and have a very solid reputation for quality.​ Below we have a number of biscuit joiner reviews that should help you in your decision. The 557 Plate Joiner Kit from Porter-Cable feature an industry leading 7 Amp motor. This powerful motor spins up to 10,000 at max rpm; meaning even the hardest of woods can be cut with ease. 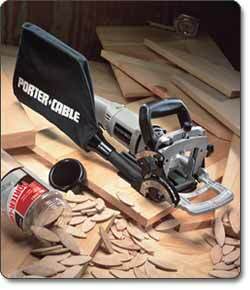 The Porter Cable 557 is one of the most versatile plate joiners available. It has an adjustable fence that can pivot from 0 to 135 degrees and includes adjustable stops at the standard 90 degrees. At 7.5 lbs it is one of the lighter models in this list of biscuit joiner reviews. Weight may not be a big factor to consider in these types of tools. However, if you are using the biscuit joiner off the workbench and holding it at various awkward angles then it is something to consider. The 557 has a whopping seven different cutting settings help you to cover a large range of biscuit sizes and shapes. It comes with a standard 4 inch blade and there is also a 2 inch blade available(sold separately). Switching the blades out is pretty simple thanks to a keyhole-slotted blade cover and spindle lock mechanism. If you are looking for a great quality biscuit joiner than can give you reliable precision and versatility every time then the Porter Cable is just the tool for you. It's versatility is thanks to the large number of adjustment options, meaning you can configure it to just about any angle and wood thickness that you require, quickly and easily every time. Suitable for both pro and home shop enthusiast you'll be making perfect joins with ease. The Porter Cable 557 is the perfect blend of features, quality and price. Undoubtedly the best biscuit joiner for the money available today. Coming in a close second to the Porter Cable is the Dewalt DW682K. Housing a 6.5 Amp motor the Dewalt is just as capable on the cutting front as the Porter. Spinning it's carbide blade at 10,000 rpm means pretty much any hardwood is easily dealt with. A highly durable biscuit joiner for any hardworking wood shop. The Dewalt has a one piece adjustable fence that can be tilted to the standard 90 degrees that you will find on most models(with the exception of the Porter's 135 degrees above). The fence is one of the most accurate available thanks in part to its twin rack-and-pinion adjustment system. ​You will also find preset stops for all the standard biscuit sizes that you will find in any home or commercial woodworking shop. The Matika PJ7000 plate joiner has a smaller 5.6 motor. However it does spin up to a slightly higher 11,000 rpm. ​A well designed extremely durable construction thanks in part to a cast aluminum front body. With six different depth setting you can handle just about any biscuits. The fence is adjustable from 0 through 90 degrees. It has positive stops at 0, 45 and 90 degrees which are the most common angles used in biscuit joins. The shoe features non-marring rubber inserts(unique to the Matika) which help with any potential material slippage. Lamello are considered one of the oldest and most respected brands in the biscuit joiner sphere. They pride themselves on being known as the "Cadillac of plate joiners" and are known for being the best plate joiner brand. The Classic X features a slide shoe, fence and multi-function stop square all made from one piece precision machined milled metal, something that only Lamello can boast. This construction method ensures virtually no side to side play on the fence that can be found on really cheap joiners. It can handle a broad range of different stock thicknesses due to the auxiliary fence that attaches to the main fence. For vertical work you can also attach the auxiliary upright so it is an ease to use it in a vertical position. The creme de la creme of biscuit joiners it is easily the most expensive plate joiner reviewed here, they are reserved only for the most expensive of woodworking shops. The TruePower comes in as the cheapest option in out list or top 5 biscuit joiners. It is a pretty no frills fairly reliable option for those that are looking to do the occasional bit of plate joining. An entry level plate joiner that offers 0 to 45 degrees cutting angle. This model is best for those on a tight budget or those that are starting out woodworking as a beginner. A biscuit joint is a means of joining two pieces of wood together with out any kind of metal fastener such as a nail or screw. They are usually invisible. A cut is made on the edge of both pieces of wood that you wish to join. These cuts are commonly referred to a plunges. A small pieces of compressed wood known as a biscuit is then placed into the plunge in either piece of wood and glued into place. This joint is both strong and usually completely hidden from view unlike a ​dovetail joint for example. They are commonly used in furniture and other decorative pieces that do not require much stronger joints or important load bearing joints. 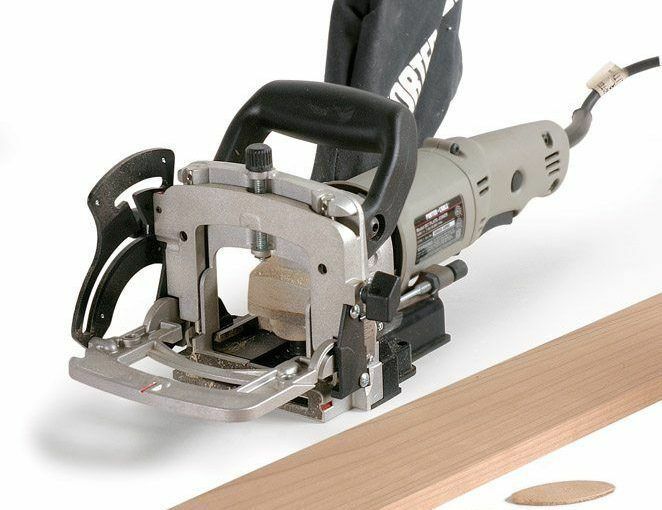 ​A biscuit joiner at its simplest is a power tool that allows you to make precision cuts into the edge of boards. They are used to cut the plunges described above. You could make these plunges without using a biscuit joiner. For example you could clamp or configure a wood router ​or carve out by hand using a chisel. This might be suitable for a one off join if you are already suitably skilled. However, if you are looking to reliably make multiple joints then a dedicated tool is required. A biscuit joiner gives you the ability to make the plunges at varying angles to the wood. Where it really excels is that you can make these plunges the exact same way time and time again. Accurate plunges are necessary, without the plunge angle and depth being easily repeatable you will end up with a finished piece that is not aligned properly and in many cases not fit for purpose. Cutting plunges into hardwood requires a sharp cutting blade and a motor that is capable of spinning up to a high rpm. Power - Ideally higher than 5 Amp, industry standard is 7 Amp. Durability - Any big brand name should have a motor that won't overheat or burn out quickly. The sharpest blades in the world are no good if you have a weak motor. ​The fences primary function is to ensure that the biscuit joiner is properly aligned at the correct angle to the piece of wood that you wish to cut. On cheaper tools the fence can be easier to secure in a misaligned manner. At a minimum you would expect all biscuit joiners to be adjustable from 0 to 90 degrees. Some models such as the Porter Cable are capable of ​135 degree adjustment. If you are cutting your plunges at an awkward angle then the weight of the joiner may become a consideration. Too heavy and it may become tiresome to use. Too light and it is probably an indication of a lower quality tool. The standard blade size is usually ​4 inches. There are smaller and larger blades available should you need them. Confused by the ​use if the terms plate joiner and biscuit joiner? Don't worry they are the same thing and you will hear people use the terms interchangeably. It's one of those unfortunate things that can cause a little confusion if you are just starting out learning woodworking.